T-Mobile added added another Android phone to its roster, but this time, it's Motorola-made. At GigaOM's Mobilize conference in San Francisco, Motorola CEO Sanjay Jha introduced the Motorola Cliq, the first device to run the MOTOBLUR overlay (A.K.A. a customized user interface). The Cliq will be available during the holiday season, but pricing has not been announced. The slick-looking MOTOBLUR skin for Android has some familiar trends we've seen on mobile platforms. Like webOS, MOTOBLUR aggregates all of your contacts and their information from various sources and displays them in one seamless client. You can also view your contacts by individual network, if you prefer. MOTOBLUR also has a single application for messaging, something we also saw on Palm's webOS. The Messages widget organizes all of your e-mail accounts into a single, universal inbox. One unique feature about MOTOBLUR's Messages widget is that it allows you to send rich text e-mails with colors, fonts and emoticons. You can also attach photos to your e-mails through the app as well. Like Nokia's Symbian S60 OS, as seen on the N97, MOTOBLUR uses a live widget called the Happenings widget to give you instant access to your social networks from the homescreen. These are a bit different than Nokia's, however, as they don't just deliver one application: Twitter, Facebook, Gmail, MySpace, Yahoo, Last.fm and other social networks are constantly connected and updated on the app. You can also update your status with this widget and have it go to all or some of your social networks. Another cool feature is the ability to track your phone via assisted GPS if it gets lost. You can wipe it remotely and then all of your information is saved on the MOTOBLUR's servers. Pretty nifty. The Cliq looks very similar to the photos we saw of the codenamed "Morrison" rumored GSM Motorola Android phone. 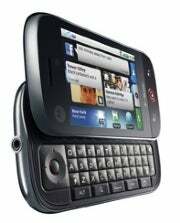 It has a similar form factor to the T-Mobile G1with the familiar slide-out full QWERTY keyboard. Unlike the G1, however, the trackball has been replaced with a directional pad that is completely covered while the keyboard is stowed. The front-face features a large, wide-format screen and what looks to be three touch-sensitive buttons. The Cliq has Wi-Fi support, turn-by-turn GPS, a 5-megapixel camera, has a standard 3.5-mm headphone jack (take note, HTC!) and streams video in 24 fps (frames per second). It comes in an attractive titanium white and winter white. Motorola's CEO Sanjay Jha also hinted that there were more MOTOBLUR Android phones to come, including one later this year. This will most likely be a CDMA phone, codenamed "Sholes," rumored to come to the Verizon network. He also said that Motorola plans to bring more Android devices in 2010. Check back for a hands-on review of MOTOBLUR and the Cliq as well as a full rated review in a few months.